DREDGING THE PASSES City of Sarasota officials are considering a plan to put three adjustable groins on the south end of Lido Key. Photo by Norman Schimmel THE U.S. ARMY CORPS OF ENGINEERS SOON WILL BE SCHEDULING PRESENTATIONS TO THE CITY AND COUNTY COMMISSIONS ON PLANS TO RENOURISH LIDO BEACH AND BUILD GROINS ON THAT KEY By Rachel Brown Hackney Editor The U.S. Army Corps of Engineers has indicated insufficient sand of the quality needed is available offshore for the renourishment of Lido Beach, making the shoals in Big Pass and New Pass the likely sources for the project, Laird Wreford, Sarasota County's coastal resources manager, told The Sarasota News Leader this week. with City of Sarasota officials and representatives of the Lido Key Residents Association, Wreford reported in a March 27 email to County Administrator Randall Reid. Because of his position with the county, Wreford was invited to attend the session, he noted. 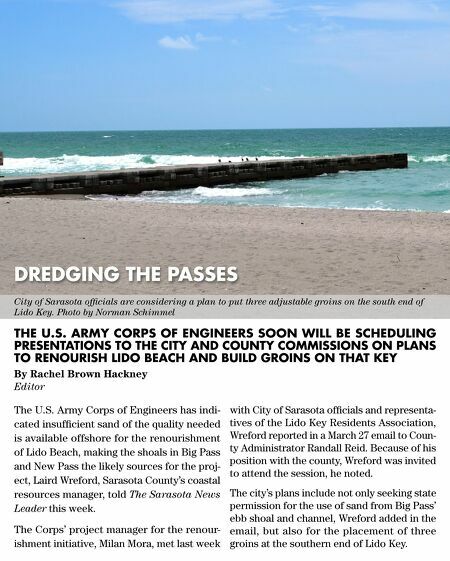 The city's plans include not only seeking state permission for the use of sand from Big Pass' ebb shoal and channel, Wreford added in the The Corps' project manager for the renour- email, but also for the placement of three ishment initiative, Milan Mora, met last week groins at the southern end of Lido Key.